Volcanoes are not choosy. They erupt wherever they can, and whenever they are ready. Two hundred and fifty years ago a terrible calamity hit the Nass River Valley in British Columbia. 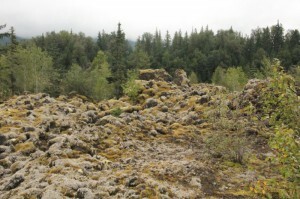 A volcano erupted and spewed lava down the hillside into the valley and then flowed northward to burn and bury two villages of the Nisga’a aboriginal tribe. The gases and the lava killed over 2,000 natives. The flow buried some of the original channel of the Nass River and pushed the entire river northward across the valley to its present location. perished. The park is managed together by the aboriginals and the Provincial Government. If you visit you will find a campground with 16 sites, and a colourful Visitor Centre which may have a resident artist on duty during the summer time. 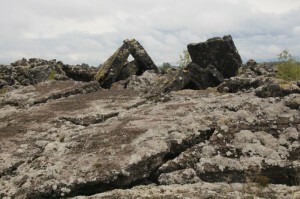 There are also maps of the track of the lava flow, and native artefacts. A guided tour will take you on a trail to the lava cone. The trail is moderately hard so wear good hiking boots for the 4 hour hike which takes you 3 kilometres over the lava to the cone. If you travel from Terrace, heading north, you will see Lava Lake. This lake is the result of the lava damming the river. Often the river now flows under the lava and is out of sight in places. The basalt lava flow is extensive and very interesting to examine as you follow trails across the surface. Normally you would find basalt lava to be very black. 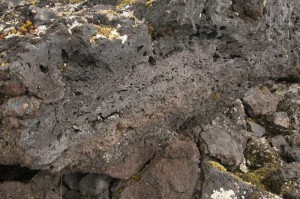 In the lava field it has a surface coating of lichens and mosses and looks somewhat tan, or yellow. Do not leave the trail as it destroys this new vegetation which is slowly turning the basalt into soil. 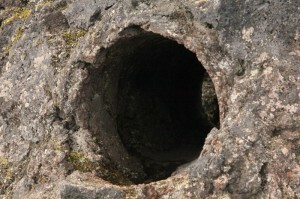 Hole in frozen lava caused when lava flowed around a living tree, which later rotted. force and pressure required to redesign the landscape in this manner. 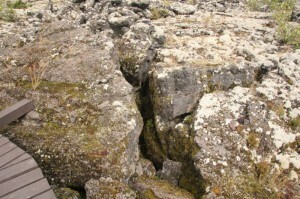 If you follow Tree Mould Trail you will see several examples of this, and you will see a hole through the rock formed when lava flowed around a live tree and solidified. Later on the tree rotted leaving the round tunnel through the rock. Some blocks whose edges you can see show multiple holes. These were gas bubbles that were trapped in the freezing lava. Bubbles trapped in frozen basalt lava. There are also attractive rapids and waterfalls. The drive in from Terrace is very scenic with great views of the mountains. Then suddenly you are on top of the lava beds. Take time to go and visit the site of Canada’s last volcanic eruption.